Salema, Portugal. A Winter day at the beach: Almost a pictorial effect with separate touching for the sky, boat, ponds and land. A rough texture was applied at the end of the process. When somebody puts on sunglasses, this person is placing a set of dark pieces of glass to protect the eyes from excessive radiation and light from the Sun. Technically speaking, the filter called “sunglasses” is designed to produce the effect of blocking the light. If these glasses are corrective, than the filter “Corrective Lenses” would distort the incoming light in such a way that the effect would be a clearer image arriving to the eyes. When a photographer sets the camera to ISO 800, what is happening is that the camera is being instructed to boost the signals arriving from the digital sensor by a factor that corresponds to 8 times the otherwise arriving signals if the camera would have been set to ISO 100. In this case, the filter is the booster (amplifier) and the effect is an image resembling having more light in the ambient. Similarly, film photographers would have used an ASA 400 film which was more sensitive than a regular ASA 100. Here, the more sensitive layer of the film (the filter) has chemicals reacting with more intensity to the same amount of light, thus providing the effect of simulating more light in the ambient. While talking about film, “Kodak Ektachrome Filter”, infrared films, “Ilford Blak and White”, etc, are (or were) films to provide specific kind of effects when capturing the light.
. By switching the lens of a camera to a 200mm or by cranking up the available zoom a number of times, the narrower field of view (the filter) simulates a magnification of the image size (the effect). These computer programs also have names ranging from Photoshop to a plethora of filter effects available for phones and tablets. Abstract. Obtained by throwing the camera up in the air (do it at your own risk). Three images of the kind were combined, submitted to a light grunge filter and a rough canvas texture applied. Some colors were artificially enhanced along with detail correction with brush work. 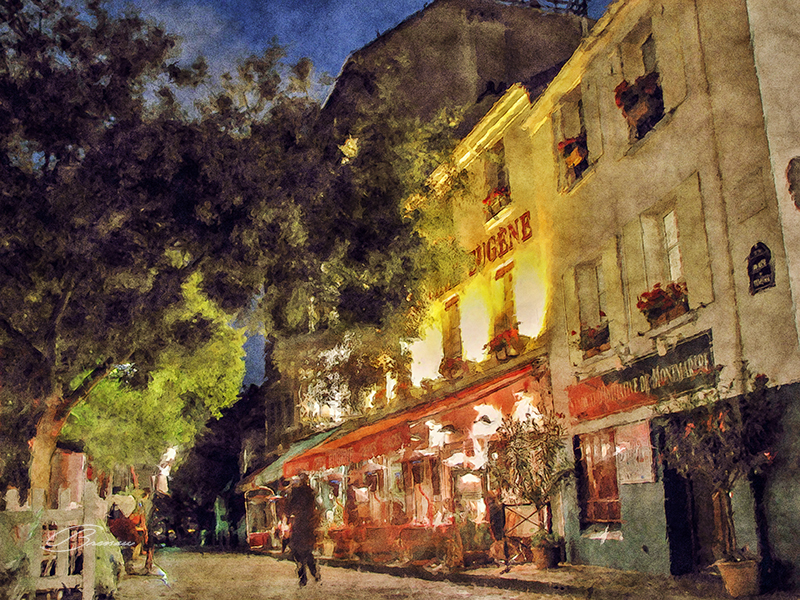 Montmartre, Paris, France. Watercolor effect with plenty of retouches. The application of filter affects after the picture was being taken and downloaded to the computer is called post-processing by the means of the specialized programs like Lightroom, Photoshop, Gimp, Aperture and thousands of other pieces of software that help the photographer and the artist to create wonderful images to be admired by millions. In this way, there are infinite ways to post-process an image loosely fitting into three distinct categories or levels of post-processing.
. Manipulation or massive processing, or to change, convert, twist, modify, extract, add and replace elements in the picture. There is no commitment to preserve the identity of the original pictures, thus opening the door for the artist to express his/her art. This is also a field for deception given that any single image alteration is admissible, either for good or for bad. This study focus on the latter, although the other steps become essential for the preparation and finalization of the work. White Flowers. A light treatment of common flowers found anywhere. 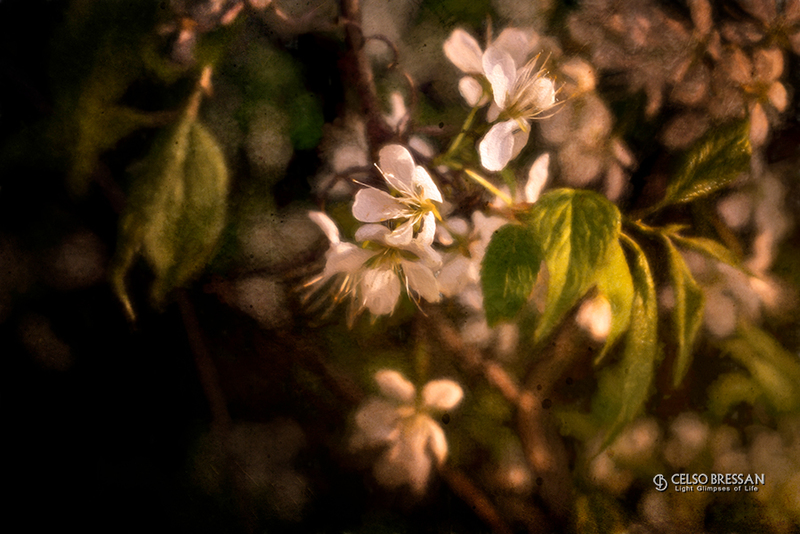 The main effects are a rough texture, light blur and intense sharpening on the flowers. Finally, a dark tone to enhance the lighter places, with plenty of brush work. Given the sheer amount of filter effects available, it is absolutely impossible to use them all. The common practice is to stick with a few and get fully acquainted with what they can do. There are filters mimicking artistic renderings from famous painters, vintage effects, abstracts, cinematic effects, old films, and many others for all personal styles and tastes. Devices: small or basic computing power working with small images that fit narrower memory requirements and to allow a faster processing. Typically, the user of this of equipment wants quick solutions and easy to use interfaces. The resources made available by these programs favor the common trend of the social works: load or take a picture, move some sliders back and forth with the finger, and then share the result to the world. This description gives the impression that this platform is only for amateurs, but some programs are so sophisticated and so powerful that professionals can take advantage of them too. Given the large palette of alternatives available, the best approach seems to select a group of programs that everyone feels comfortable to work with. There is one disadvantage of these programs, though, that may be relevant or not depending the needs of the photographer or artist: the size of the images worked by these programs is much smaller and may become an impediment for certain kinds of jobs. However, sizes around 2,000 px are common and can be acceptable for a great range of needs. When producing artistic pieces of work using filter effects, this limitation becomes irrelevant as the images can be brought to a desktop and enlarged to the dimensions required. If the result is not the best one, an excellent solution is to apply one or more additional filter effects to mask the imperfections. Another disadvantage inherent to these kinds of devices is the lack of resources to work over an image with all the detail and care that precise tasks need. In these cases, the pictures need to be worked on desktops. Photo Editor: simple but providing a range of filters for special occasions. A large collection of different kinds of filter effects ranging black and white conversion, star effects, the attractive Impression, texture effects, the moderately interesting Simplify and the glow effects among others. In particular, Impression provides an array of artistic effects varying from pure abstract to stylistic effects resembling works from Cezanne, Rembrandt, along with watercolor, impasto and other effects. The price revolves around US$ 100 but, from time to time, there are offers with significantly reduced price. Most of these products act as plug-ins to Photoshop and other tools but some can also run stand alone (that is, they run by themselves). More information can be found at Topaz Laboratories. This product works in a different way than others as it is comprised by a basic product (Filter Forge) running both as a plug-in or a stand alone application. By itself, it does not do anything but to follow a “recipe” or a script containing instructions on how to do a specific effect. These scripts amount on the thousand and are usually built by contributors. Once the basic module is installed (there are different classes with varying prices ranging from US$ 30 to US$ 300), any number of scripts can be download and used without any additional expense. This means that new scripts can be downloaded as soon as they are launched. Depending of the class of the basic product, any user can build his/her own filter and optionally contribute to the general library of scripts. As imagined, there are filters for any kind of effect imagined, some of them slight variations from others, including alterations from previous ones. The only disadvantage is that, the more complicated and theoretically interesting the filter, the longer it takes to run, sometimes for hours on end depending on the size of the original image and settings applied. More information can be found at Filter Forge. Adobe Photoshop includes the traditional package with some basic filter effects that could produce interesting results specially if combined with other effects. The amount of effects is limited and restricted to 8-bit images only. In addition, it is possible to download extensions to produce special effects, some paid and some free. In particular, there is the Free Textures from Russel, which presents a well packaged combination of textures for almost all situations. From a variety of different products, the FX module is the one that fits the bill for this study. It either works stand alone or as a plug-in. Standing out, the set of filters mimicking film characteristics takes a prominent role in this package. Its cost revolves around US$ 70 depending the offers. More information can be obtained at ON1. The NIK Collection has been in the market for quite a while providing a range of effects both for color and black and white work. Recently, Google made the collection available for free download. For all reasons, it a must have! More a collection of effects ready to be used (similar to applications available for devices) than a sophisticated filter effects product, it does not seem to provide much room for creativity and work. Tagged as around US$ 40 depending on the offer, more information can be found at Macphun. Praga, Czech Republic. Typical Houses: The houses were “adapted” to be uniform and then underwent a light impasto effect, finally covered by a blanket of noise. 3) Photoshop Actions: just like a cooking recipe, an action is a prerecorded sequence of small steps operating over the current image being worked. Actions are very useful in automating repetitive tasks although with limited interaction during the execution of the action. Virtually any single resource in Photoshop can be recorded in an action, created by executing manually the desired sequence of steps with the “tape recorder” on. Later, the action can be played over and over. The market offers thousands of actions, either for free or charged, to perform many different effects. Another kind of action is used by Filter Forge where the filter is pre-programmed elsewhere and its execution is controlled by parameters set before the execution. The simplest approach to apply filter effects is to take a picture, submit it to one or two filters, adjust back and forth the available sliders until – bang! – the masterpiece is ready for the world! With luck or, maybe, with some skills, it may be possible to get consistent and satisfactory results almost constantly. It does not much explanation as it is the way it is. 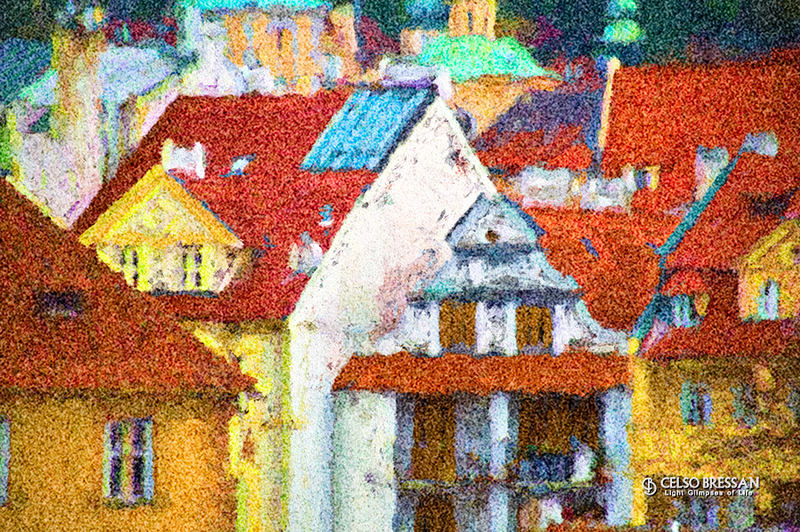 A more elaborate and artistic way would do what painters do when they create their pieces of art: select the scene or a theme (a picture), remove useless elements (cut and crop), add interesting features (clone and make a composite), choose the palette and the tonalities and then paint (apply the filters). This is not a mechanical act, takes time, takes art and may produce pieces of art that may be unique. Indeed, it is a conscious act of creation where one of the by-products is the satisfaction of exteriorize the inner soul. It all starts by selecting the appropriate picture for work. While some pictures were just “made” for the job, others simply do not render anything interesting at all. By constant experimentation, by working and working, with time, it is possible to “visualize” or “conceptualize” which kind of pictures works better with the effects at hand. The expression “appropriate picture” means to chose a picture with great potential for good results fitting the interests of the artist. There is no rule of thumb when choosing a candidate for work; it all goes with the experience and feeling. An obvious example is not to select a portrait or a picture with diffused details if the style are landscapes with plenty of details. Conversely, a shiny and modern skyscraper would seldom call for an old film effect. Before any attempt to apply a filter, the picture needs to be prepared for the work by removing unwanted details, adjusting the light, application the Rule of Thirds, aligning the horizon, adjusting the contrast and any other tweaks necessary. The degree of freedom in this step is open and only depends on the creativity. As well, this is the right moment to do cloning, composites and significant image alterations because filters tend to create unique texture arrangements that normally “smooth out” imperfections. On the other hand, this uniqueness makes further corrections very difficult to be performed, if not forcing the work to be started over. If filter effects, on the one hand, hide details, on the other hand, enhances some other details not seen before or not regarded as relevant. The details may be an unexpected surprise but may be distracting as well, again forcing the rework of the image. Indeed, there is a strong element of surprise after applying the filters, either positive or negative, and the general advice is always save intermediate stages of the work in case it is needed to go back in time for some rework. A factor to be considered is the resolution of the image undergoing treatment as some filters may literally be “triggered” by the lack of details or the presence of them. A simple explanation for this fact is that most filters work by analyzing a set of adjacent pixels before applying the affect and these sets vary significantly from a low to high details. Therefore, the amount, shape and appearance of a particular effect may differ according to different degrees of resolution. In particular, images produced by old digital cameras or devices like tablets and phones are excellent starting point for investigation and work. Another technique is to lower the resolution or the size of the image and apply the filters. Then, almost at the end of the work, bring the resolution or the size back to its original format (or even bigger) and apply one or more very light filters just to smooth out the imperfections created by the enlargement. Likewise the lack or excess of details, the presence of noise, either natural or created on the fly, may introduce interesting twists as the noise affects the clusters of pixels used in the calculations to produce the effect. By experience, after knowing how certain filters “react” to different kinds of images, it is possible to prepare the image specifically for this or that filter, thus maximizing the potential results. All set, time to apply the filters; there are no other rules than freedom to exercise creativity. 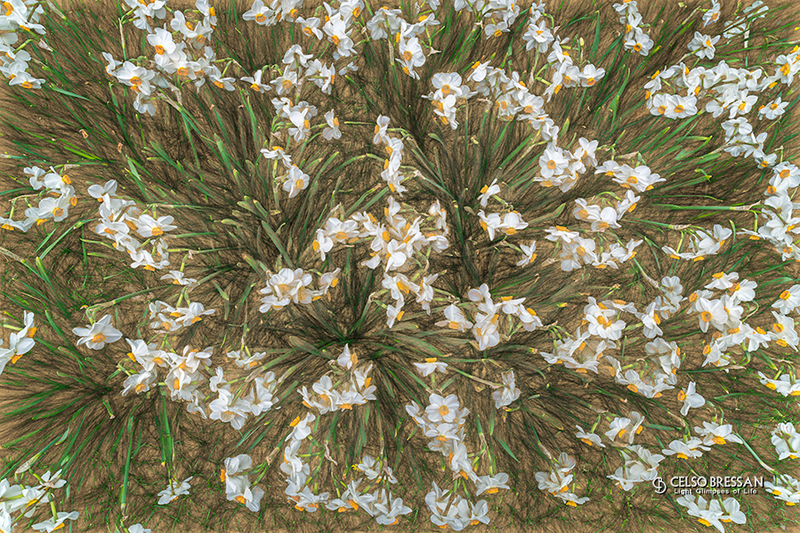 One or more filters can be applied by varying their sliders until a pleasant result is obtained. 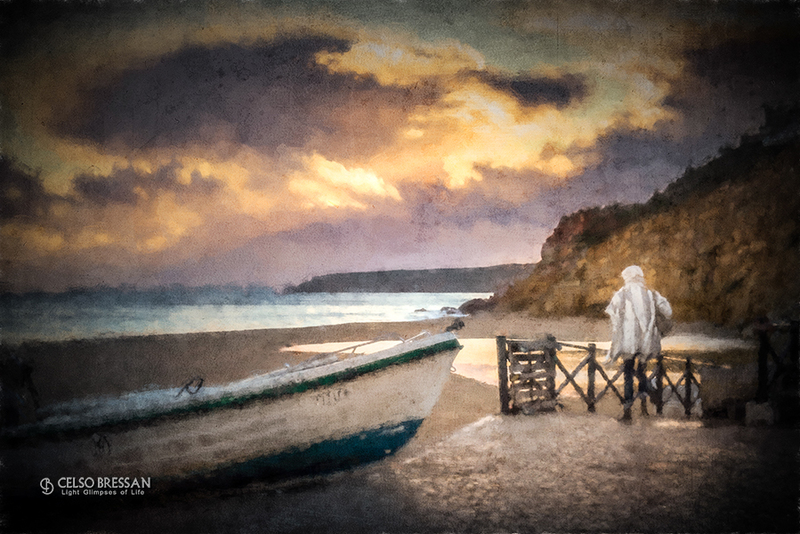 An interesting possibility is to apply a filter using existing local adjustments (that is, an adjustment that can be applied to parts of the image) or bring back the image to Photoshop and selectively apply the filter to parts of the image using the brush and layers. When the work with filters is done, comes in the fine tuning of the colors, the reduction of the effect in selected areas (if desired), the enlargement of the image if needed, contrast and other adjustments. It is always a good suggestion to use a texture to complement the work and give that extra punch. Because the work is similar to a paint on a canvas, it is suggested to use a tablet and a pen to allow for more controlled flow of work. Abstract. An unsuspected and heavily worked Toyota rear light with random impasto brushes and a canvas texture. The finishing was various color work and changes. Daffodils. Seen from above, removed the clutter and flattened the ground. Most of the colors were applied by hand and combined with the original picture. Working with filters is an invitation for unexpected results, a reason to express one’s art and an absorbing task. As such, the surprises may be good or may be bad. With practice, the good ones will be dominant and will be the reference for future works. About the bad ones, is solution is either to use the garbage bin or to start all over with a different idea, different filters or even with a different picture. It is not uncommon to produce a brilliant piece of art (at least to whom is doing it) that there is the desire to replicate the process to other pictures. More often than not, there were so many steps taken that it would become impossible to remember all of them with the proper order, thus making it difficult to obtain the same kind of results over and over unless careful notes would be taken. But, then, it defies the basic concept of being creative all the time when using filter effects. This post was first published on Light Stalking and then edited to better fit this format. In December/2016, this post was substantially changed to include more descriptive information about filters avaliable in the market.